I have to get everything ready for Thanksgiving, so didn’t have enough time to get a photo taken for a more fiber related post. So I am showing off a couple of my Pysanky eggs. I really like to do this type of egg dying. I love the way the hot wax flows onto the egg shells, forming fine lines that would be hard for me to make with a pencil or a brush. I do have trouble finding suitable eggs. So many organic farmers have switched entirely to brown eggs. The eggs in the super markets usually have the dye adsorbing protein coating washed off by harsh soaps. I live in a planned neighborhood so can’t raise my own chickens and eggs, which is for the best. We had one chicken when I was a kid. My sister rescued it from a the science lab at school. I hated it; dirty, stupid thing that it was. A stray dog had it for lunch one day, you could hear my sister screaming for blocks. Irony was she brought the stray dog home too. So whenever I get the hankering to dye more eggs I go on a quest to every available farmers market. I hope 2009 will bring lots of smooth, protein covered eggs ready to be dyed. 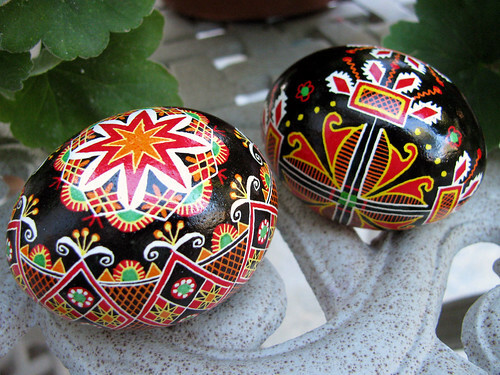 I will post on Ukrainian embroidery another day, and also the meaning of the different designs on the eggs. This entry was posted on Tuesday, November 25th, 2008 at 3:00 am and is filed under Craft. Tagged: Eggs, Pysanky. You can feed this entry. You can leave a response, or trackback from your own site.